Home > Breaking News > Will Amazon's Echo Soon Be Outdated? Will Amazon's Echo Soon Be Outdated? At Mobile World Congress 2018, Samsung (NASDAQOTH: SSNLF) confirmed rumors that it’s building a home assistant to rival Amazon ‘s (NASDAQ: AMZN) market leading Echo device. Samsung’s artificial-intelligence assistant, christened Bixby, will power the speaker and go toe-to-toe with Alexa, Google Assistant , and Apple ‘s Siri, among others. Though slightly behind some of these major rivals, Samsung is entering the home assistant market in time to claim a piece of the growth that is expected in the coming years. It helps that the tech giant has a secret weapon that could give the Amazon Echo and other similar offerings a run for their money: the television. According to a survey conducted by National Public Radio (NPR) and Edison Research, one in six American households now has a smart speaker. That’s far from calling the technology pervasive, but it represents a 128% increase from 2017. Another report from technology analyst Canalys sees global shipments of smart speakers breaking 50 million in 2018 . Those may sound like big numbers, but there is plenty of room for expansion. By comparison, nearly 1.5 billion smartphones were sold in 2017. The vast majority of smart-speaker sales will likely occur in the U.S., with sales in China being the second highest at a modest 4.4 million estimate. As high-speed internet coverage expands across the globe — one of the biggest barriers to smart-speaker adoption — sales numbers will likely continue to rise. Samsung is chasing the trend, but the fast pace of adoption and the long-term potential make it a decent bet. However, besides just another smart speaker hitting the market, the tech giant thinks another type of home assistant is appealing. Samsung’s 2018 QLED TVs will come packaged with Bixby as well. That isn’t unique, as other TVs out there are getting Alexa or Google Assistant integrations. However, Samsung is taking things one step further and making the new TVs a hub for the smart home much as the Echo, Google Home, and other smart speakers can be used now. Samsung’s new QLED TVs can be used as your smart home’s hub. Image source: Samsung. 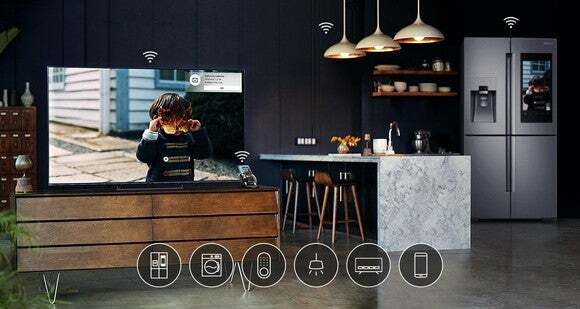 For starters, the TVs will be compatible with Samsung’s SmartThings home monitoring, sensor, and security lineup. The TV will also be able to control other Samsung appliances and other gadgets you might have around the house. The idea is that if the TV is already a central part of your home, it’s all you’ll need. There is a drawback, though, as the TV takes commands by way of a speaker on the remote control. Samsung releasing a TV and a smart speaker makes sense. According to the same NPR survey mentioned earlier, the smart speaker is changing habits — 34% of respondents said their new device was replacing time they spent on their smartphone, and 30% said it was replacing some TV watching. Because Samsung sells both smartphones and TVs, it makes sense that it would want to stave off competitors encroaching on its turf on various fronts. The QLED TVs and their built-in smart-home hub will likely need some refining (like the need for the remote, as an example). However, the early trailblazers like Amazon and Google could end up at a manufacturing disadvantage in the long term … they don’t build TVs. For many consumers, bypassing the smart speaker and going straight for an upgraded television with the same capabilities as the Echo and other home assistants might make sense, if only to remove one more device from the clutter. David and Tom just revealed what they believe are the 10 best stocks for investors to buy right now… and Samsung wasn’t one of them! That’s right — they think these 10 stocks are even better buys. John Mackey, CEO of Whole Foods Market, an Amazon subsidiary, is a member of The Motley Fool’s board of directors. Suzanne Frey, an executive at Alphabet, is a member of The Motley Fool’s board of directors. Nicholas Rossolillo owns shares of Alphabet (A shares), Alphabet (C shares), and Apple. The Motley Fool owns shares of and recommends Alphabet (A shares), Alphabet (C shares), Amazon, and Apple. The Motley Fool has the following options: long January 2020 $150 calls on Apple and short January 2020 $155 calls on Apple. The Motley Fool has a disclosure policy .